Healthy, gorgeous hair is anyone’s dream but achieving it is not easy. Salon treatments and other superficial hair growth methods may not be enough for your hair to grow. For hair growth, one of the most important things to consider is diet. A nutritious, balanced diet is one of the biggest factors that affect the health and growth rate of your hair. Likewise, hair supplements can work wonders, especially if you want your hair to grow quickly. Even though hair is mostly made up of protein, it also needs vitamins and minerals to grow. Apart from factors such as age, genetics, and hormones, nutritional deficiencies also influence hair growth. It’s not always possible to get all the nutrients our body or hair needs through food alone. In such situations when the body is devoid of nutrients, hair supplements act as a substitute. These supplements can help nourish your hair inside out, which results in your hair grow faster, stronger, longer, and thicker. It can improve the length and condition of your hair as well as the appearance of your nails and skin. People can either rely on vitamin supplements or on a varied diet to grow their hair faster and diet is almost always considered to be the better option. But, for people with strict schedules who are unable to follow the best dietary practices, supplements ensure optimal intake of vitamins. This B-vitamin helps produce glucose and breaks down proteins into amino acids, supporting your hair, which itself is composed of protein that naturally supports healthy hair. Food items that are rich in Biotin are mushrooms, avocados, eggs, salmon, peanut butter, yeast, cauliflower, raspberries, bananas, walnuts, almonds, sunflower seeds, soybeans, lentils and whole grains among others. These will help you get more of this nutrient to increase the density of your hair and have thicker, longer hair. Niacin is another vitamin from the Vitamin B family that is responsible for nourishing and re-hydrating the scalp and helps the hair follicles to produce stronger strands of hair. The main function of this vitamin is to transform carbohydrates into energy, and it also helps to maintain the structure of the blood cells and improve blood circulation, which results in greater blood flow to the scalp, as well as more oxygen and nutrients to the hair follicles. Niacin is also known as Vitamin B3 or nicotinic acid, and its deficiency can result in dull, brittle hair. So, it’s important that you consume an adequate amount of niacin from supplements or through foods. The recommended daily amount of niacin is 16 mg per day for men and 14 mg for women. Green peas, chicken breast, tuna, turkey, avocados, mushrooms and peanut contain high amounts of Niacin. This is an essential vitamin for all cells in your body, which include hair cells (the fastest growing tissue in the human body). This is one of the best vitamins for hair growth and thickness. It helps produce the natural oil sebum that moisturizes your scalp and helps to keep your hair healthy. Vitamin A also contains antioxidants that nourish the scalp and prevent the hair from drying out. However, make sure that you don’t consume too much of this vitamin, because it’s fat-soluble and your body cannot flush it out that easily. Studies have shown that an overdose of vitamin A can also contribute to hair loss. So keep a measure of how much you intake. Drink carrot juice daily for quick hair growth as carrots are an excellent source of vitamin A. Other food sources are sweet potatoes, liver, egg yolk, milk, spinach, dried apricots, mangoes and dark leafy greens. Apart from biotin, there are other B-Vitamins that are vital for hair growth. They promote cell growth and division, provide extra support to healthy hair and help it maintain a lustrous integrity. They help in creating red blood cells, which carry oxygen and nutrients to the scalp and hair follicles, which is an important process for hair growth. Food sources that contain B-vitamins such as B6 and B12 are sunflower seeds, pistachios, whole grains, almonds, milk, and dark, leafy greens. Moreover, animal food sources such as meat, fish, and lamb are also good sources of riboflavin or B12 vitamin. Collagen is a very important protein for hair growth and thickness and Vitamin C can provide that. This hair growth vitamin can prevent graying and hair dryness effectively. It’s also an important antioxidant that is good for our health and prevents damage to the hair follicles from the oxidative stress caused by free radicals. Moreover, Vitamin C prevents the production of the baldness protein DKK-1 which is present in people who suffer from hair loss. Vitamin C deficiency can result in weak and brittle hair that is prone to falling out or shedding. Similar to biotin, Vitamin C is a water-soluble vitamin, and daily intake of this vitamin through food items or supplements is necessary to maintain the health of your hair. 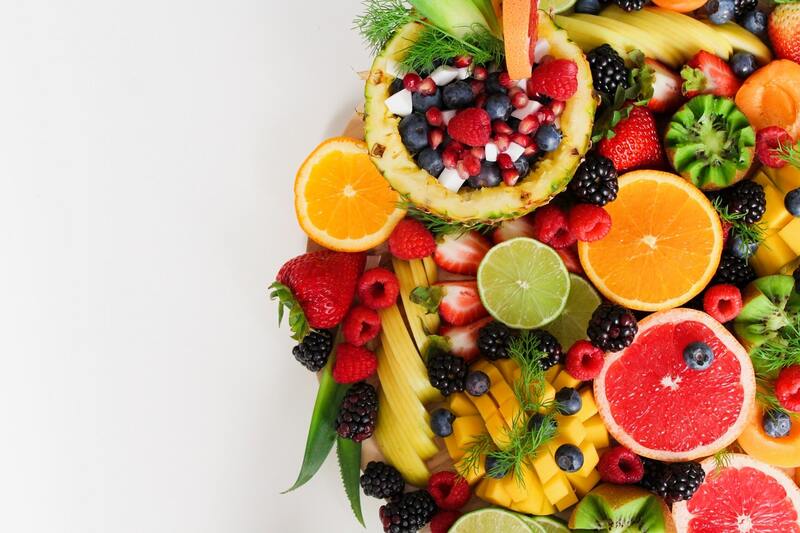 Citrus fruits such as lemon, sweet lime, mandarin, strawberries, blueberries, pineapple, kiwi, grapefruit, and oranges are high in this vitamin. Other Vitamin C-rich foods include spinach, winter squash, peppers, and tomatoes. Like Vitamin C, Vitamin E is an antioxidant that builds and repairs tissue and prevents oxidative stress caused by free radicals. It also helps in blood circulation in the scalp and encourages the repair of damaged hair follicles, which ensure hair growth. Vitamin E locks in moisture as it maintains the oil and pH level balance in hair and protects your hair from drying out. Though pH is needed for healthy hair if the pH level exceeds it can cause clogging of the hair follicles. Apart from supplements, one of the greatest sources of Vitamin E is Avocado. Other food sources are fish, peanuts, cooked spinach, asparagus, broccoli, pumpkin, sunflower seeds and dried herbs. Likewise, vitamin D deficiency is also one of the primary causes of hair growth. Omega-3 fatty acids are essential fatty acids that are good for your health as well as your hair. It can nourish and protect your hair and help in regrowth. They add a silky shine to your hair. Omega-3 fatty acids are responsible for a healthy cell membrane that facilitates efficient transfer of nutrition to the hair cells. If you prefer supplements instead of this fatty acid, then look for one with the highest amounts of EPA and DHA, as they are the active ingredients in the fatty acid. Natural sources of Omega-3 fatty acids include mackerel, salmon, cod liver oil, herring, oysters, sardines, flax seeds, chia seeds, walnuts, soybeans. Folic acid makes your hair thicker and shinier. It boosts healthy cell generation and therefore, is a stimulator of natural hair growth in both men and women. Usually, folic acid is found sufficiently in B-complex vitamins, so if you are already consuming this supplement, it’s not necessary to take folic acid separately. Folic acid-rich foods for hair growth include whole wheat grains and cereals. Moreover, all the citrus fruits, dried beans, and all leafy green vegetables like spinach contain folic acid. Capsicum, French beans, broccoli, and chilies too are rich sources of folic acid. Apart from vitamins, minerals also play an important role in hair growth. Iron, Zinc, and Magnesium are vital minerals for your body and hair. Iron promotes shiny, strong hair, Zinc plays a key role in enhancing hair luster whereas magnesium promotes follicle health, which results in healthy hair growth. Usually, hair supplements contain all these minerals in the required quantity and if you are looking to get it from food, food sources rich in Iron, Zinc, and Magnesium include Brazil nuts, chicken, red meat, poultry, eggs, spinach, raisins, oysters, chickpeas, salmon, apricots and wild rice. For long, luscious hair you can either take vitamin supplements or focus on including these in your diet. Eating a balanced, nutrient-dense, real food-based diet is the best way to consume the vitamins needed for your hair growth. This accompanied by healthy habits like exercise, yoga and green tea. In fact, catechins in matcha have been proven to block DHT, which causes hair loss. But, if you don’t have the time to spend looking for the appropriate food sources, then supplements area better option. Make sure that you consult a healthcare professional before you start consuming supplements. Externally, home scalp massages or homemade hair masks can also help keep your hair healthy. Catalin is the founder of Unblock.net and Web App Meister. He's a design enthusiast and loves matcha, and is uber passionate about blockchain technology and travel.